This month as part of Graham & Brown’s brand ambassador challenges, myself and forty-nine other bloggers are teaming up to share how we would create “eureka” moments in our home. “The Eureka trend is a chance to create, delight and wonder, offering the opportunity to inspire others through your own interior design ventures. Creating a sudden, unexpected realisation to all those who enter the doors to your humble abode on how they can represent their own characteristics with colour and vibrancy.“ – The Eureka Trend. I have always be torn between having all white and grey home interiors with small pops of color or vast amounts of vibrant shapes and colors popping out from every corner. Over the years I think I have probably covered both trends numerous times over. I am still in between what I really love but for me the most important thing when decorating a home is to let the family’s personalities all shine through. To me, this really creates a “eureka” moment because guests can get a sense of what kind of family you are just by being in your home. I love a good room that has a wow factor and a focal point. One that not only inspires ideas but leaves people a little perplexed and in awe of it’s color and style. I think oranges and yellow really can do that to a room. They are one of my favorite combinations especially bright yellow. It almost takes you to a different era yet appears modern at the same time when you add shapes and lines for the eyes to follow it can make a big difference to any room. I believe vibrant colors always make a smaller room appear bigger, and more welcoming. There are so many options to add your personality to a room. You can do it by framing vibrant abstract pictures on the wall so your guest really focus in on them popping from a neutral colored wall or you can go all out with your wallpaper and really bring the color and shapes into the entire room with accessories to match. I have made a pinterest board for my eureka inspired trend, pop over and have a look and let your home speak to your guests. Follow Let’s Talk Mommy’s board Decorate with color on Pinterest. I don’t think you can go wrong decorating with color as it’s up to your own taste of what is too much. Sometimes a whole room full of one color sounds scary and turns out to be your favorite room in the house because colors make us feel a certain way. Yellows are great for making people feel inviting and welcome. Bright colors make people smile and feel happy. Deeper and darker colors are considered to be romantic. Colors affect different people in different ways, I respond to pastel colors while others like bolder ones. My bedroom is always a deeper more relaxing color then the rest of my house. I feel this makes me sleep better I really do. I used to have a completely yellow room as I wanted it to feel like sunshine each morning that I woke up, even though yellow is my favorite color it just didn’t help me relax when I was trying to unwind at night. Whether you go big or you go small, what do you want your guests to take from your home decor? Do you have a room that has the “eureka” trend? I would love to know hear from you, comment below. I am a brand ambassador for Graham & Brown and each month I participate in a home decor challenge. All opinions and creativity are my own. If you haven’t heard of Graham & Brown before, please check out their amazing website for more information and inspiring home decor. 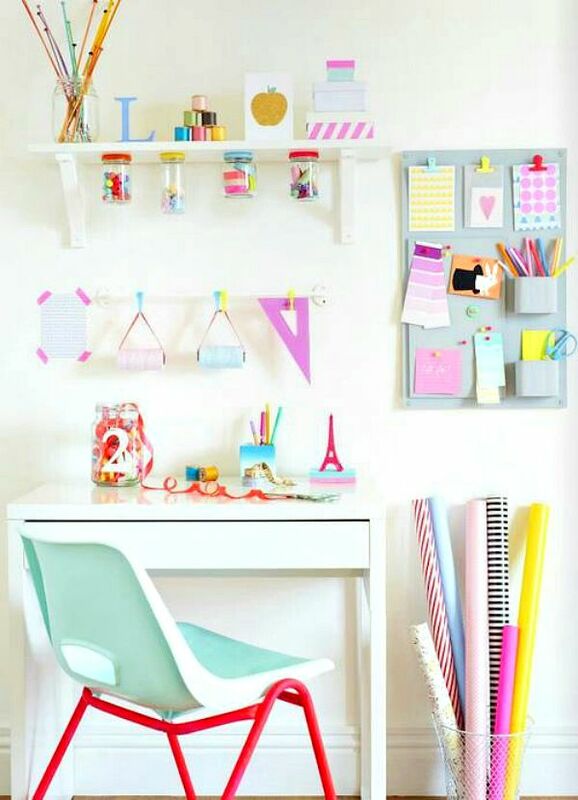 Oh that office is so pretty, especially the turquoise- like colours of jelly beans!! I love color and I used to be the same neutrals and blacks too in my home. Once I added color I didn’t go back. lol Glad you like it. And you’re right, you can’t go wrong when decorating with colours cause it’s up to your own taste! Thank you Olga, mustard yellow is my true favorite color ever. Love it.